PRO: Signed with the Riders in March, 2019…selected by Saskatchewan in the 1st round (5th overall) of the 2018 CFL Draft…signed with the New York Jets as an undrafted free agent in April, 2018. 2018: Attended training camp with the New York Jets…played three preseason games. 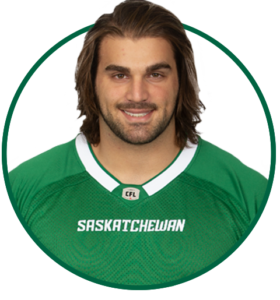 COLLEGE: Spent four seasons at the University of British Columbia (2014-17)…started 31 of 32 career collegiate games…spent time at left tackle and right guard…played in the 2017 U Sports East-West Bowl…named 2017 Canada West All-Star…part of team that won the 2015 Vanier Cup.